One of our greatest storytellers shares his own story for the first time. . . but it is so much more. Long celebrated as one of our great storytellers, some of his best stories, however, are about his own life. They have though — up until now — remained untold. Given that the art of story-telling runs deep through his beloved Maori culture, Witi Ihimaera always knew there would come a point where he would have to bite the bullet and start on his own story, but the issue was a fraught one for him. Something that troubled him, he says, was that this would mean he would have to put himself centre stage as the main character and ‘Maori just don’t do that. Individuals being the centre of attention just doesn’t sit comfortably with us. ‘The other issue he had to struggle with was the memoir’s shape. It simply couldn’t be a conventional biographical structure told through a linear narrative. 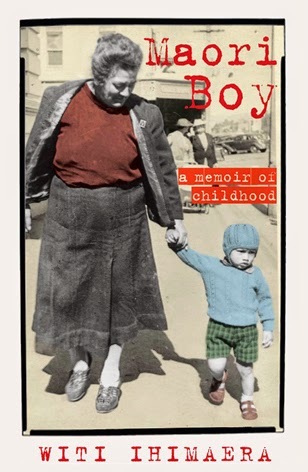 His story seemed to be ‘all over the place, organic with its various twists and turns for this fun-loving and rather unusual little Maori boy from Gisborne’. He says he saw his life story taking the shape of a spiral and at its centre is his whakapapa which includes both his Maori and Scottish/Irish ancestry. ‘A writer just doesn’t come out fully formed. A writer is the result of experiences,’ says Witi. A towering and profound figure in Witi’s early life was Teria, his beloved grandmother and family matriarch who graces the cover of the book tenderly holding toddler Witi’s hand. We learn that Teria was also the inspiration behind his ground-breaking novel, The Matriarch. Devastated by her sad passing when he was just 11, Witi realised, later in life, that he had probably suffered a nervous breakdown which left him paralyzed with grief for the following year. There’s his shock at being instantly stripped of his prestigious place within the family as the first-born and only son when his older half-brother walks onto the farm, the product of a union before his parents met, which his father had kept a secret. There’s also his Mormon upbringing which provided Witi with another belief system that seemed to sit comfortably alongside Maori spirituality as it did for many. These are just a few of the touchstones which shaped the young Witi Ihimarea. In terms of what would go into the memoir, he certainly had no problems with material. In fact, it soon became apparent that there would need to be two parts. The first would deal with his whakapapa based on interviews with his parents over several years. What we end up with is a rich, powerful, multi-layered and totally unique story that leaves us with such a strong sense of what it means firstly to be Maori; and secondly, to be Maori growing up in a Pakeha world. For this reason, it is something every New Zealander should read. What comes through is a strong sense of identity and to know Witi is to actually know his whakapapa and also our country. Witi’s wonderful sense of humour always shines through, so while he pulls some punches, there’s no bitterness or judgement. He simply lays things down as he sees them and leaves us to join the dots. Link to Witi's interview with Kim Hill last Saturday morning on Radio New Zealand National.